Heading into the 2016 NHL Entry Draft, many fans and pundits believed that the Buffalo Sabres would use the eighth overall pick to bolster their blue line. Instead, the Sabres passed on available defensemen such as Charlie McAvoy and Jakob Chychrun and drafted the Swedish sniper, Alexander Nylander. Now, as we head into the 2017 NHL Entry Draft, many people are once again expecting the Sabres to use their first-round pick on a defenseman. Logically, drafting a blue liner with the eighth-overall pick makes sense: the Sabres had one of the league’s worst defenses in 2016-17, and everyone knows that defense is Phil Housley’s bread-and-butter. Still, there are plenty of reasons to believe that the Sabres will use their first-round pick on a forward for the fourth-straight year. Let’s break down why the obvious pick — defense — may not be so obvious after all. The front office of the Sabres may have blown numerous opportunities to fix its broken defensive unit during the regular season, but it sure has not wasted any time bolstering the backend now that summer is here. Oh there are ways to explain why the Canadiens would deal away a 24-year-old, former-first-round-pick, puck-moving defenseman, who had just reached a career-high 28 points. None of them are really good, though. 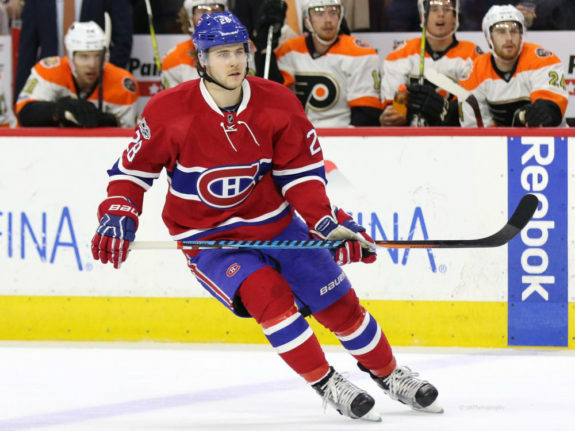 Even though Beaulieu is prone to lapses on the defensive end of the ice, he is young, moves the puck and is about to become the sort of defenseman who can give the Sabres 30+ points per season. Whatever Bergevin’s reasons for getting rid of him for less than fair value, score one for Botterill, who managed to do in the span of one month what GMTM could not do during the entire 2016-17 regular season — improve Buffalo’s blue line. Toss in prospect Brendan Guhle, who most people believe will be fighting for a spot on the Sabres roster during preseason, and you have a defensive corps that is already much more capable of keeping pucks away from the goaltender than last year’s squad — and that is before we even get to the conversation of who the Sabres will add via free agency conversation. Even though the Sabres have already revamped their defense, any fan of hockey knows that you can never have too much depth at the blue line. Depending on which free agents the front office will be targeting on July 1, Botterill and company could still be planning on using the eighth-overall pick on a defenseman. The problem is that it is hard to imagine a scenario in which a defenseman worthy of using that pick will still be on the draft board for the Sabres. The best blue line prospect in the draft, Miro Heiskanen, is projected to be a top-five pick in every single mock draft I have read. 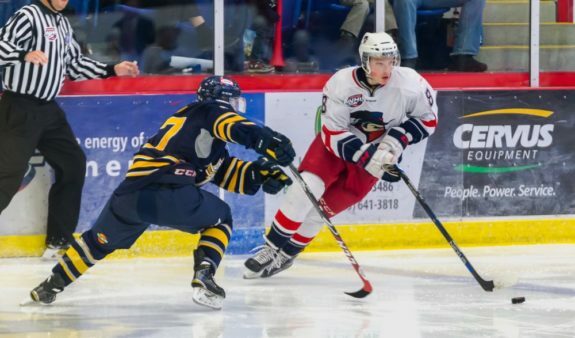 Meanwhile, the kid currently considered to be the second-best defenseman in the draft, Cale Makar, has seen his stock rise so much this year that it is hard to see him falling into Buffalo’s lap. If he does, great. If not, the Sabres should transition from defense to offense in a hurry. Why should Buffalo abandon the idea of drafting a defenseman in the first round if Heiskanen and Makar are off the board? Simple — those are the only two blueliners worth using a top-ten pick on. 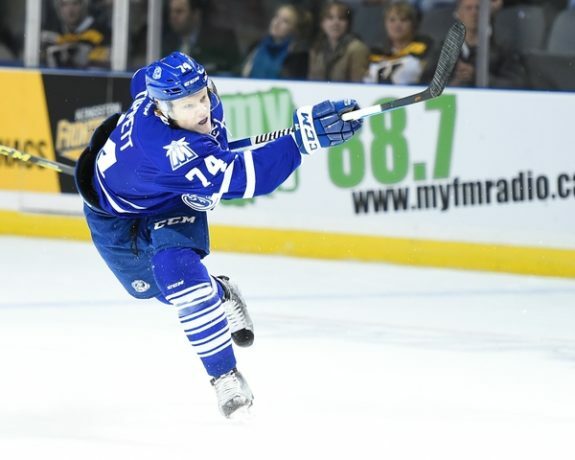 When the 2016-17 season started, Swedish defenseman Timothy Liljegren was considered to be the best blue liner in the draft and a probable top-five pick. Fast forward to now, and the story has changed. 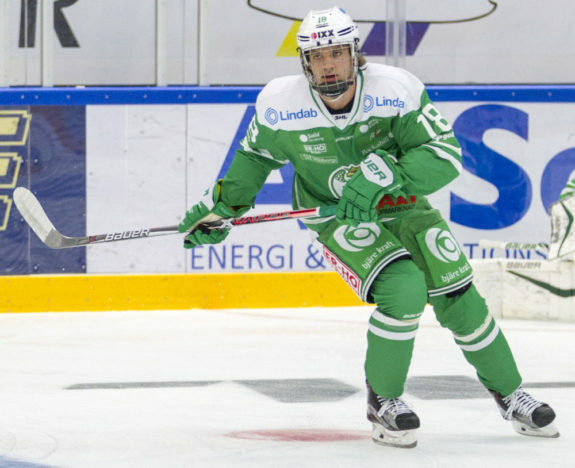 After a lack-luster season playing for Rogle BK in the SHL in which his peers caught or even surpassed him, Liljegren is now considered a bit of a risk. Outside of this mock draft in which SB Nations’ Five for Howling decided Liljegren was worth the seventh-overall pick, it’s tough to find many credible mock drafts that still consider Liljegren worthy of a spot in the draft’s top ten. This is not to say that Liljegren is suddenly a bad player who is not worthy of being drafted, but the Sabres should not use the eighth pick to select a player who would still be available in 12-15 range. It would make far more sense for Botterill to trade down and gain an asset in order to draft Liljegren than to pass up a player with higher value, and by this point in the draft, none of the remaining players with the highest value will be named Timothy Liljegren. The Sabres are going to want to get maximum value out of their first-round pick, and settling for a defenseman other than Heiskanen and Makar won’t cut it. Fortunately, there are numerous forwards who will still be available at the eighth spot who will provide more bang-for-the-buck than someone like Liljegren. As it just so happens, the Sabres could use scoring at pretty much every position, so missing out on a blue liner would not be the worst-case scenario by any means. The Sabres may have a few prospects who appear to have successful NHL careers ahead of them in Nylander and Rasmus Asplund, but the pickings are pretty slim after that. It also doesn’t hurt to remember that Buffalo still has Tyler Ennis and Matt Moulson listed on the roster. Even though the handful of forwards who might be able to make an immediate impact in the NHL will be gone by the time Buffalo is ready to pick, there will be still be players with top-six potential up for grabs. For example, Sportsnet has the Sabres using their first-round pick on Martin Necas, the Czech Republic standout who is ranked fifth among all European skaters over at NHL.com. Meanwhile My NHL Draft and The Hockey Writers’ Larry Fisher both have the Sabres selecting Owen Tippett, who was labeled “A pure sniper who will score lots of goals in any league” over at Dobber Prospects. I have even seen Swedish center Elias Pettersson, a 6’1″ center who produces on both ends of the ice and who is currently the second-ranked European skater over at NHL.com, being mentioned as someone who could be available when the Sabres are on the clock. Even though the Buffalo Sabres still cannot consider their defensive corps to be a finished product, the recent upgrades at the blue line have given the front office a bit more breathing room when it comes to the 2017 NHL Entry Draft. Obviously, Botterill would be foolish to pass on Heiskanen or Makar should they fall into GMJB’s lap. Otherwise, given the lackluster collection of offensive talent the Buffalo Sabres currently own on their roster and in the pipeline, it would behoove Botterill and company to think offense-first, and use free agency and the later rounds of the draft, to continue adding depth to the blue line.